We all dread those treacherous Albany, New York winters. Obviously, you’ll find yourself anticipating the impending winter weather, but you also have to prepare for those holiday trips to the relatives. If your car isn’t prepared for these road trips or winter driving, then you should probably start searching for a brand-new ride. Well, it’d be difficult to find a better option that Chevy’s various offerings. Fortunately, all of Chevy’s SUV options have proved to be perfectly logical targets. These various nameplates provide all of the capabilities and amenities that a driver could want from a winter ride, including powerful engines, safety functions, and an incredible amount of cargo space. This may be one of Chevy’s smallest SUV offerings, but the nameplate is still more than capable of overcoming those treacherous winter conditions. After all, the vehicle (along with Chevy’s other SUV offerings) is equipped with a number of notable safety functions that will surely protect you in the event of a collision. Actually, some of these features may even prevent an accident from occurring in the first place. For instance, inclusions like the Side Blind Zone Alert will provide you with an extra set of eyes whenever you’re traveling at a high speed. The accompanying Lane Departure Warning will alert the driver when it’s unsafe to switch over, while the Forward Collision Alert can anticipate an impending crash and adjust the brakes accordingly. In the event that you are in an accident, the 10 airbags will surely provide you with all of the cushion you need. The high-strength steel safety cage is equally as important, as the vehicle shouldn’t compromise during a collision. Finally, if emergency help is needed, the OnStar Automatic Crash Response system can connect the driver with an OnStar Advisor, who will immediately notify emergency personnel. You’ll surely be traveling a lot during the winter season. As a result, you’ll depend on your SUV’s array of technological amenities to keep you and your passengers entertained. Fortunately, the Equinox delivers, as the vehicle is equipped with a number of notable features. It starts with the brand’s Chevy MyLink system, which allows the driver to access an assortment of applications. Thanks to the Apple CarPlay and Android Auto compatibility, drivers can also perform many of their phone’s basic functions. Engineers even included a built-in 4G LTE Wi-Fi. That way, if any of your occupants are required to access the internet during their journey, they’ll always have a strong wireless connection that they can rely on. The vehicle can even be equipped with the myChevrolet Mobile application, which allows drivers to remotely access their SUV. This means on those cold winter mornings, you won’t have to leave the house if you want to warm up your cabin for your ensuing commute. Speaking of traveling, drivers will also require plenty of interior room if they’re going to be taking any extended trips during the winter seasons. Fortunately, these individuals won’t have any issues fitting their luggage into the Chevy Traverse, as the SUV delivers some of the best interior specs in the entire class. Ultimately, drivers can unlock an incredible 98.2-cubic-feet of space when the rear seats are hidden, meaning you can also squeeze in any giant Christmas presents. If you’re briefly pulling over to a pit stop and need a spot to hide your most valuable gadgets, you can access the hidden storage space behind the Chevrolet MyLink unit. This way, you can trust that your phone or wallet will never be stolen. Chevy’s engineers have also made it incredibly easy to fit all of that cargo into your SUV. Thanks to the inclusion of the Smart Slide second-row seat, drivers can easily manipulate their interior to fit any combination of cargo and passengers. There’s even a hands-free lift-gate, meaning owners won’t have to fumble with their keys as they’re looking to load their SUV. Ultimately, you won’t find a more convenient experience elsewhere. This Chevy SUV is an ideal target because of its versatility. 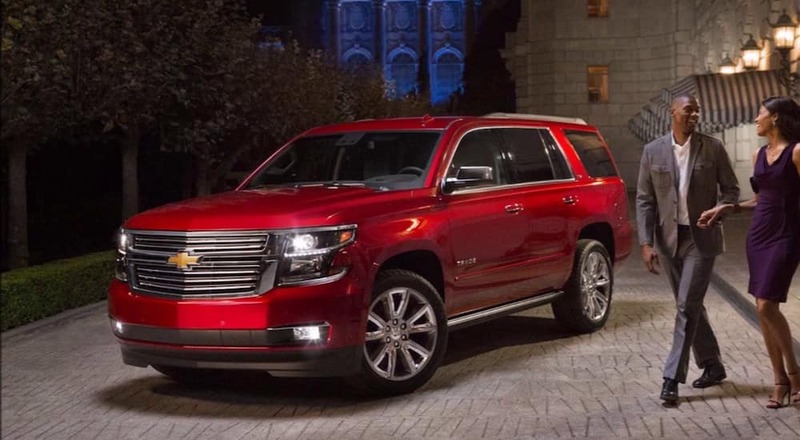 Whether you’re seeking power, cargo space, or technology, you’ll surely find that attribute emphasized in the Chevy Tahoe. However, this particular vehicle is especially notable because of its array of notable comfort features. For starters, the Tahoe delivers one of the quietest driving experiences in the entire class. Thanks to features like the acoustic-laminated windshield and the triple-sealed inlaid doors, drivers and occupants will never be distracted by the howling winds or the humming engine. Meanwhile, the inclusion of the clever Head-Up Display means drivers will never have to strain their neck as they’re attempting to view important information. Whether you’re looking for specifics on your speed, fuel efficiency, or vehicle diagnostics, the Head-Up Display will showcase that important information right in front of you. One look at the hulking Chevy Suburban would essentially confirm all of the power that’s lingering under the hood. After all, the nameplate is one of the biggest offerings in the entire class, so it shouldn’t be much of a surprise that it can also crank out a whole lot of power. However, the Suburban may ultimately surprise some owners with its impressive fuel efficiency specs, as well. The 5.3-liter EcoTec3 V8 engine is one of the most impressive offerings in the entire industry, delivering all of the power that a driver could expect from an SUV engine. Drivers can ultimately anticipate a 355 horsepower and 383 pound-feet of torque, leading to an 8,300-pound towing capacity. However, the most impressive spec is the best-in-class 23-mile-per-gallon highway fuel efficiency. Thanks to these numbers, drivers won’t have to dish out extra money at the gas pump.